Jaiden Dokken (left) and MacKenzie Grinnell earned top honors at the 2019 WA Coast Works competition to support sustainable businesses on the Olympic Peninsula. Photo by Garrett Dalan. 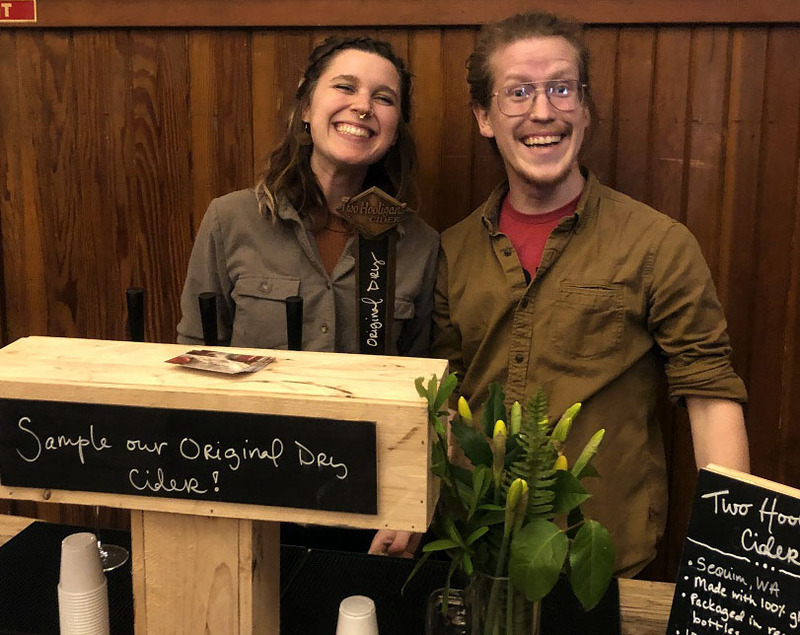 But Jaiden, 24, and MacKenzie, 25, have bigger ideas for this fruitful pastime: to produce their locally sourced, sustainably crafted cider commercially. Now, thanks to the 2019 Coast Works Entrepreneur Event, they are making that dream real. Their budding business, Sequim-based Two Hooligans Cider, won the top prize of $10,000. This year marks Coast Works Entrepreneur Event’s fourth year. “Coast Works is a great way for The Nature Conservancy to invest in communities for lasting conservation,” says Garrett Dalan, Washington Coast Community Relations Lead for the Conservancy, which created Coast Works. “It looks to support and inspire entrepreneurs and triple bottom line businesses along the Washington Coast.” By “triple bottom line,” Garrett refers to three complementary goals of resource-based, sustainable businesses: Profit, People, and Place. Coast Works is more than a competition, providing business training and resources to participants over several workshops. Photo by Jackson Blalock. The Entrepreneur Event is a bit like a mini-version of the television show “Shark Tank.” Applicants submit business ideas in September. Then in November, finalists attend an intensive four-day business plan workshop in Forks, run by Enterprise for Equity and Center for Inclusive Entrepreneurship. In March judges hear pitches, then award grants ranging from $2500 to $10,000. They look for solid business ideas that are sustainable and unique—not to mention viable­—and which benefit the local economy and environment. Lorrie Mittmann, owner of Peninsula Adventure Sports in Port Angeles, garnered this year’s $5,000 second place grant. Lorrie currently organizes four adventure sports races, like the 80-mile Frosty Moss Relay. Based on visitor bureau estimates, athletes attending those races in 2018 spent $78,000. The races boost the local economy other ways: goods purchased, locals hired for day-of-race support. For now, Lorrie works at North Olympic Land Trust, and runs Peninsula Adventure Sports on the side. “My dream is to expand my business to full time, and do everything I can to help my community and local economy,” she says. She envisions more races, in a wider variety of Peninsula locations and seasons. She’ll use the prize money to upgrade timing equipment and broaden marketing. For the cider-making hooligans, Coast Works Entrepreneur Event was inspiring, enlightening, and a great boost to their business chops. “The workshop was huge,” Jaiden says. “It was good to actually wipe the apple juice off our hands and come inside to work on the computer.” They also discovered that conservation and sustainability are templates for other Washington coast small businesses, too. “The Coast Works contest was a really cool way to put a name to what we were doing,” says Jaiden. With a $10,000 grant from the WA Coast Works Alliance, Two Hooligans Cider can expand their sustainable cider operation with new equipment and a machine that washes bottles recycled for reuse. Photo by Havilah Gautschi. Two Hooligans will use the money for a high volume cider mill (they’ve been hand pressing those 600 gallons on borrowed equipment), used kegs, and a bottle washing machine. In addition to hard cider, they plan to produce a sparkling, non-alcoholic cider, unique on the Peninsula. Their goal is 1200 gallons of Two Hooligans cider on tap by December 2019. The Nature Conservancy’s Partners in Washington Coast Works include: Quinault Indian Nation, Key Bank Foundation, Washington Department of Commerce, Bank of the Pacific Sound Community Bank, Umpqua Bank, Enterprise for Equity and Center for Inclusive Entrepreneurship.